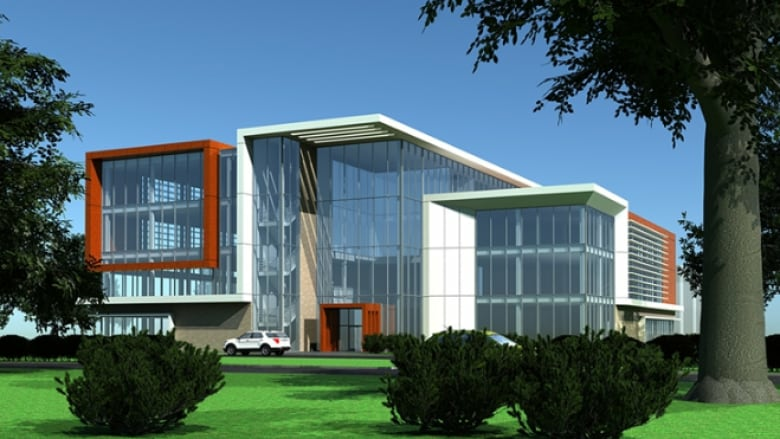 CBC has learned that Brandt Developments and CNIB completed a building plan for a new office tower on CNIB lands in Wascana Park months before Brandt was selected as the winning proponent to construct such a building. CBC has learned that Brandt Developments and CNIB submitted a building plan for a new office tower on CNIB lands in Wascana Park — and had it evaluated by the organization that runs the park — months before Brandt was selected as the winning proponent to construct such a building. 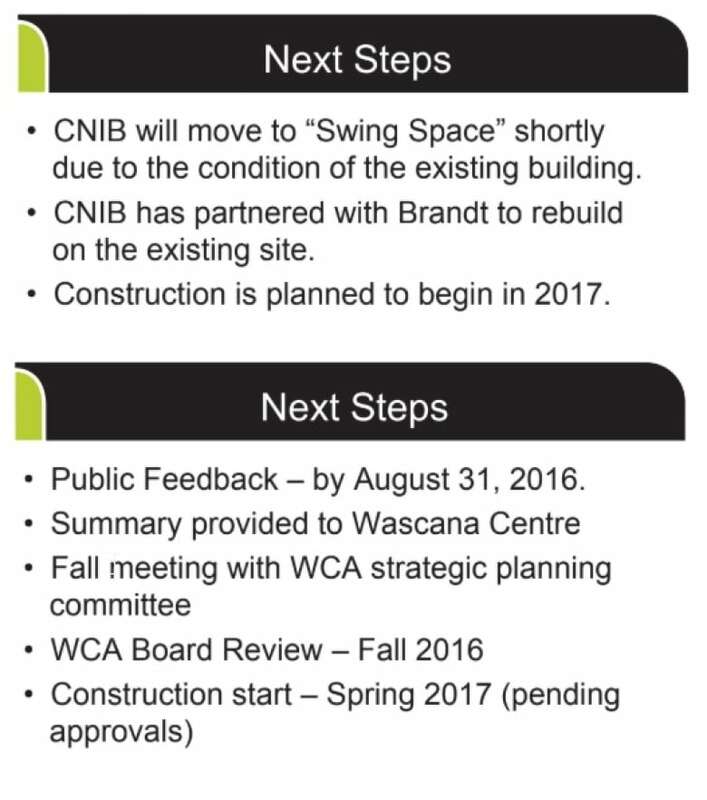 Until now, CNIB, Brandt and the Government of Saskatchewan have publicly said the Brandt/CNIB proposal first went to the Wascana Centre Authority (WCA) for review in the summer of 2015, after a tendering process that saw Brandt selected as the winning bidder. The crowd at a public meeting run by Brandt and CNIB in August 2016 was told that Brandt only came into the picture after being selected in the June 2015 tender process. The provincial government told CBC in an email that the WCA's Architectural Advisory Committee (AAC) first reviewed the Brandt/CNIB proposal in August 2015. Documents obtained by CBC show that Brandt and CNIB submitted a "fully developed scheme" for a four-storey commercial building to the WCA in October 2014 — months before the tender process began — and the WCA began reviewing it at that time. The plan was so advanced that the architectural committee complained in a Nov. 11, 2014 report, "the committee can only function effectively if projects come forward at the early stages where the concept is malleable." That was just one of many things that concerned the AAC about the project, which aimed to replacing the existing 18,000 square foot CNIB building with a 77,500 square foot facility. Roger du Toit, chair of the architectural committee, wrote in an Oct. 21, 2014 report that, "the scale and character of the proposed project does not comply with the [Wascana Centre] master plan." In the November report, he wrote "the committee has profound difficulties with the proposal, stemming in part from the size and layout of the building." Neither Brandt or CNIB have replied to requests by CBC for an explanation of these new revelations. The provincial government did send an email in response, but it didn't address the questions asked. Paul Emanuelli, an internationally known procurement expert and author of the leading textbook Government Procurement, said the fact that Brandt started working on the building project months before it went to tender raises a series of fairness and transparency questions. Emanuelli said the chain of events deserves scrutiny, especially because public resources like government land and a public park are at play. "While standards of fair bidding are important in all tendering processes, these transparency standards are particularly important when connected to the expenditure of public funds or to the use of public resources," he said in an email to CBC. The AAC's concerns escalated in the months and years that followed. It dubbed Brandt's project "dangerous to the integrity of the vision and purpose of Wascana" and a "precedent setting divergence from the 'five noble purposes' fundamental to the historic concept of use for the park." Since 1962, Wascana Centre was preserved as a sanctuary from commercial development, set aside exclusively for the development of the seat of government and the promotion of recreation, education, culture and the environment. The CNIB building was built in 1955 and was grandfathered into the park even though it didn't fit the park's purposes. The architectural committee said Brandt was trying to benefit from CNIB's special status. "The only reason this proposed facility is under consideration is that CNIB has had a place there prior to the formation of Wascana Centre." After years of battling back and forth, one committee member resigned in 2017 after protesting that he and the committee had been shunted aside. Everyone seems to agree that CNIB's old building, constructed in 1955, was in need of replacement. In 2013, the organization launched a fundraising campaign for the building. In April 2014 it posted a video online showing off a concept of what a new, rather modest building might look like. In an interview with CBC last month, CNIB Saskatchewan's executive director Christall Beaudry said that in 2014 Brandt was one of the companies CNIB approached during fundraising. Beaudry said that, "[Brandt] were one of the proponents that came forward and said 'This might be something we're interested in,' " but that in the end, "nobody had really come to the table with the funds that we needed to develop the project." She had told a similar story at an August 2016 public consultation meeting about the project. "In 2014, we started calling on local businesses for support. In May of 2015, we did an expression of interest out to the community to see who might be interested in working with us on this development. In June of 2015, a developer was selected," she said at the meeting. Beaudry failed to mention that Brandt and CNIB were working closely together long before CNIB put out a tender looking for a developer. The government of Saskatchewan provided a similar account to CBC last month. In response to the direct question, "When did the Architectural Advisory Committee first review the CNIB/Brandt proposal?" a spokesperson from the Ministry of Central Services wrote "the original CNIB/Brandt concept was submitted to Wascana Centre Authority on August 14, 2015." Bernadette McIntyre, executive director of the WCA, wrote an email on Oct. 29, 2014, with the subject line CNIB Property Development. It was addressed to Shaun Semple, president of Brandt, Garry Nenson, CNIB regional vice-president, Richard Murray, Deputy Minister of Central Services and others from Brandt. McIntyre informed the group that the architectural committee had reviewed Brandt's initial October 1 proposal and had some concerns. She wrote that the AAC said "the scale and character of the proposed project does not comply with the master plan" and she said the committee would not recommend the project because "it would not advance the character, quality, amenity and image of Wascana Centre at this very important gateway and visual access to the parkland." The committee suggested Brandt may want to consider another location. In a follow-up note to the AAC a couple days later, McIntyre said "the reaction has not been positive from the developer." She said Brandt was determined to keep the project the same size and to build it in the old CNIB location. A few days later, "in an effort to meet the proponent's timeline," the AAC issued another review. In her email to Brandt summarizing this new report, McIntyre hinted at why Brandt was proposing such a large building. She said the committee "will not challenge your statement that the floor area proposed is necessary to make financial sense of the project." We now know that Brandt's plan is to give CNIB 4,000 square feet of space in the building for free and lease out the remaining more than 70,000 square feet at market rate. The committee did recommend changes. It said that in order to comply with the standards for the park, Brandt should reduce the height of the building, use Tyndal stone on the building's exterior, reduce surface parking and change the building's orientation, among other requests. The AAC's report said the committee was unhappy that Brandt had brought such a fully developed project because that made it difficult to work with the developer given that "suggestions are inevitably seen as negative rather than positive criticism." In December 2014, the board said there were still, "concerns regarding the size of the building, the increased traffic congestion and the impact on the park." It decided it required some input from the land owner, the government of Saskatchewan. The board agreed to ask Richard Murray, Deputy Minister of Central Services, to get guidance and direction from the provincial government regarding how to proceed. In a December 3 update to the AAC, McIntyre said "as of last night, the indications are that the province will support the concept of this proposal, so it will continue to be interesting." On March 30, 2015, the provincial government sent an email to the WCA saying, "CNIB should seek options for development through an invitation process." No one explained where this idea came from or what motivated it, but CNIB took quick action to do what it was told. On May 6, 2015, CNIB posted a "request for expression of interest" ad in the newspaper. 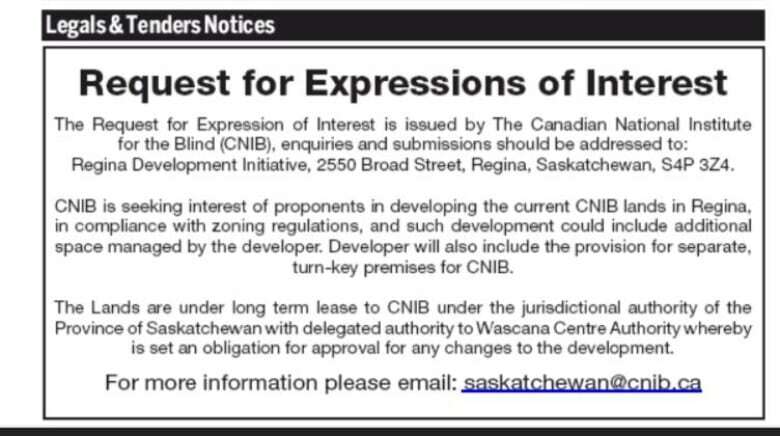 "CNIB is seeking interest of proponents in developing the current CNIB lands in Regina," said the three sentence ad. Beaudry told CBC last month that several companies responded to the expression of interest. She wouldn't provide CBC with proof of that claim and she wouldn't provide the tender documents. What she did confirm is that the very next month, June 2015, Brandt was selected as the winning bidder and by July 1, 2015, Brandt and CNIB once again submitted a proposal to the WCA. McIntyre told the AAC in a July 7, 2015 note, "we expect to see the same or very similar design to what you have reviewed before." CBC asked procurement expert Paul Emanuelli for his thoughts on how this tendering process was handled. "These facts beg the question of whether other bidders were advised that the tendering authority had already received an unsolicited proposal for the project," he said in an email to CBC. Emanuelli also questioned "whether the involvement of a specific bidder during the planning stages impacted the fairness of the resulting tendering process for other bidders." Finally, he noted that the timeline — from the newspaper ad soliciting expressions of interest on May 6 to the final selection being made in June 2015 — seems tight. Emanuelli questioned "whether the short timeframe for the resulting tendering process was sufficient to allow for a fair bidding opportunity for other bidders." CBC asked CNIB for an interview about its process but got no response. The AAC's response to the July 2015 submission was similar to its previous one. A July 10, 2015 email from then-interim board chair Fred Valentine said the Brandt building and the purposes for which it was intended didn't meet the park's requirements. He warned that approving it would create a slippery slope. He said this "apparently general purpose building would set a precedent making the way for the acceptance by Wascana of other, similar uses." Valentine noted that proposed contract language for the Brandt building would include, "but not be limited to general office tenants the nature of whose activities does not unduly detract from the activities of other tenants in the CNIB Wellness Centre." He worried that this could open the door for other general office-use buildings, facilities which don't comply with the park's master plan. Valentine concluded that while CNIB is a worthy organization, permitting it to stay in the park by approving a facility like this "is dangerous to the integrity of the vision and purpose of Wascana." The critique continued in a 2016 review of the project. The architectural committee seemed to cast doubt on Brandt's claim that providing 4,000 square feet of free office space to the charity made the "rebuilding" of the CNIB facility a philanthropic exercise. "The balance of the project use (some 96% of the proposed net rentable) is cited as accommodating not-for-profit and for-profit associated medical and health related services and other commercial uses as need be to ensure the viability of the 'rent free' accommodation of the CNIB use." Brandt, CNIB and the government have failed to provide clear answers about their plans for the building despite continual questioning. In July 2016, the government signed a leasing agreement with CNIB for the land. That agreement contained a list of proposed types of tenants that can lease the property. The government and CNIB say the list is secret and the public can't see it. In the 2017 budget announced March 22, 2017, the provincial government announced it would dissolve the WCA, which had been a partnership between the province, the City of Regina and the University of Regina. In the WCA's place, the province would establish the Provincial Capital Commission (PCC) which, it said, would introduce a more "streamlined" approach to running the park. Then-finance minister Kevin Doherty said the WCA model made it, "incredibly difficult to get things done." About a week later, Valentine wrote what would be his final critical review of the Brandt project. 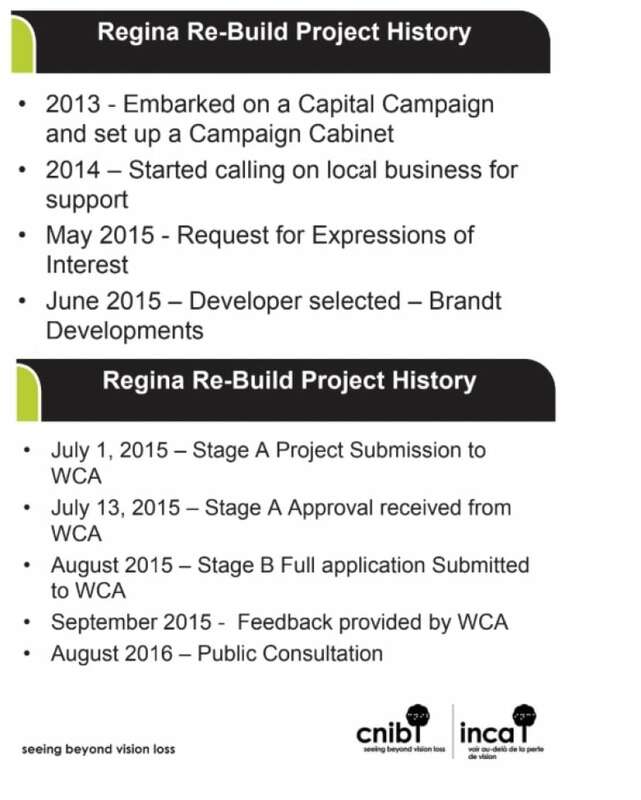 In an April 2, 2017 note intended for the WCA board, Valentine said he had recently learned that the Brandt submission "is to bypass the regulatory review of the Wascana AAC and to be presented to the Wascana Authority Board directly for approval April 7, 2017." The email repeated many of the concerns about the Brandt project the AAC had raised over the previous three years. "The committee cannot help but point out, however, that in the rush to ensure the continued life of the CNIB in this particular location, a significant change in the 'mandate and public trust' of the Centre is put into effect." Valentine closed his email by suggesting the upcoming board meeting was at the behest of Brandt and/or CNIB. "The committee regrets that the proponents have taken the unusual and precedent-setting stop of appealing directly to the board for permission to abrogate the principles upon which the Wascana Park is founded," Valentine wrote. In reply, McIntyre told Valentine that his committee's advice had been heard and she assured him that Brandt had acted on some of the recommendations of the committee. She also warned Valentine, "before I forward what sounds like an accusation to the board, you may want to reword it. Telling a board they have broken the law is a serious matter and they would be required to legally defend in some manner." In a brief note, Valentine asked that McIntyre withdraw his note and offered his resignation. CBC has also learned that another board member resigned around the same time. Michael Robertson resigned January 19, 2017. It's not clear why. The WCA did not approve the Brandt proposal at its April 7 meeting. In June, the WCA was disbanded and the PCC was formed. Under the WCA, the province, the city and the University of Regina had shared power. No one entity could make a decision without the support of at least one of the others. Under the PCC model, the province has a clear majority. The PCC has five board members: one from the university, one from the city and three from the province. The provincial government could now control the board's direction. In September 2017, the new board approved the Brandt proposal. It was officially announced in March 2018. An all new AAC board, David Edwards, Derek Kindrachuk and Genevieve Russell, was appointed in June 2018. Russell resigned one month after her appointment. A replacement, Lloyd Isaak, was named to the committee in December. 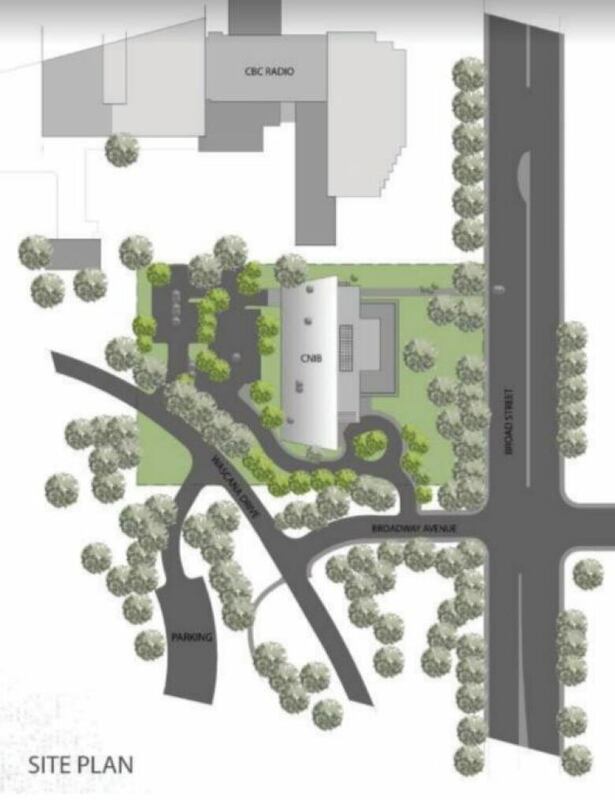 In early January 2019, that committee began to review Brandt's detailed architectural plans. If approved, the project can move ahead. Brandt's VP of Development, Brent Sjoberg, says the company hasn't gotten enough credit for pushing forward with this project despite obstacles. "There's a strong philanthropic aspect to this project," said Sjoberg. "And you know I think it probably is the case that many other developers out there might have not stuck with this project." 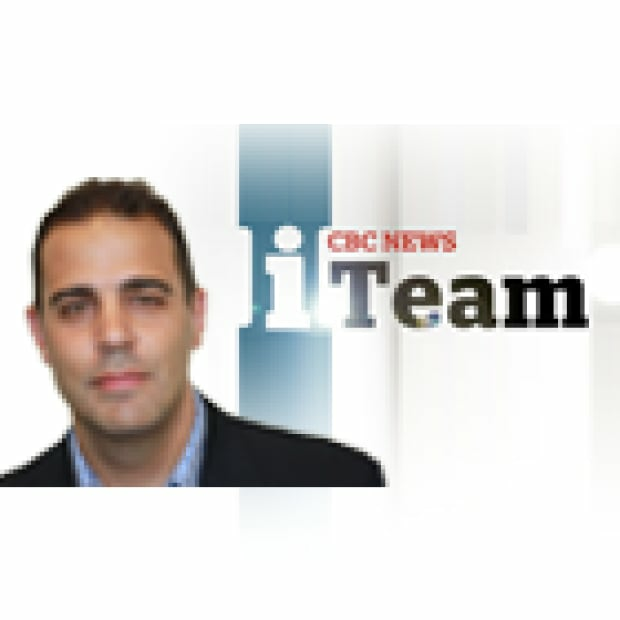 Sjoberg has failed to reply to CBC's emails and text requesting further comment about the new revelations in this story. In January, he sent the iTeam a text saying "we can connect once further details get firmed up." Demolition of the former CNIB building began last month.